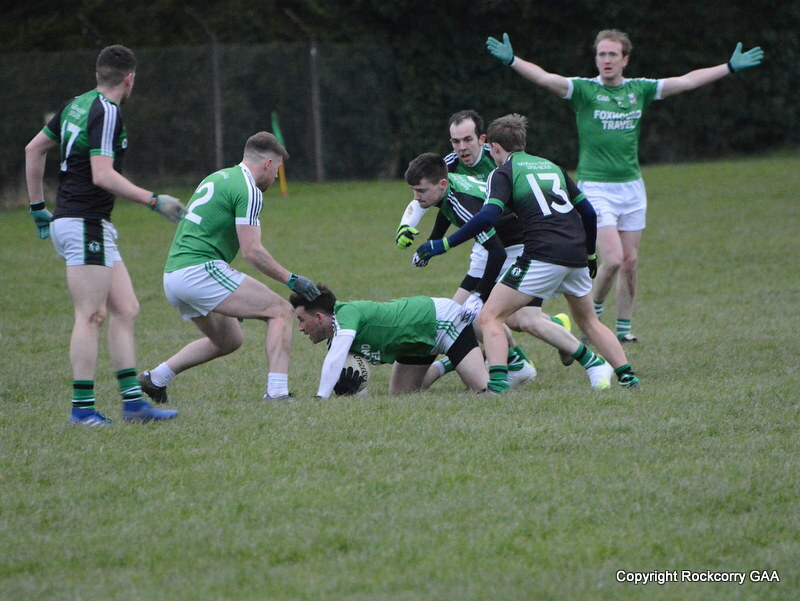 When our senior team played Cremartin on Saturday 31st May it was very evident that a number of players were not at their best and I think a fairly simplistic description would be that it definitely was not one of our finest hours! Over the past couple of week’s we have witnessed some remarkable and truly outstanding performances from the lads, against all the odds, but we never really got stuck in to the game and while we can all agree that it was a pretty poor performance, the most disappointing aspect of the match was it was also a very disheartening performance from the lads as they lost out on a final score-line 0-7 to 0-16. The game was played in glorious sunshine and Pairc Naomh Mhuire looked absolutely amazing as the beautiful rays of the summer sun beamed down across the lovely green & lush sod. It was Cremartin who exploded out of the blocks and had a score on the board just twenty five seconds after the throw-in with a neat point from Kevin McVicar. Anthony Tate had a chance to equalise a minute later but his effort at the target drifted wide while down the other end Cremartin fired over a fine point from the boot of Paddy McNulty and they repeated the feat on the 7th minute with a super finish from Fergal Mulligan to lead by 0-0 to 0-3. We got our first score on the 11th minute when Mark Daly converted a long range free-kick and a couple of minutes later Garry Calvert showed his guile & craftiness to round his marker and curled over a fantastic point with the outside of his right boot to close the gap to a single score. 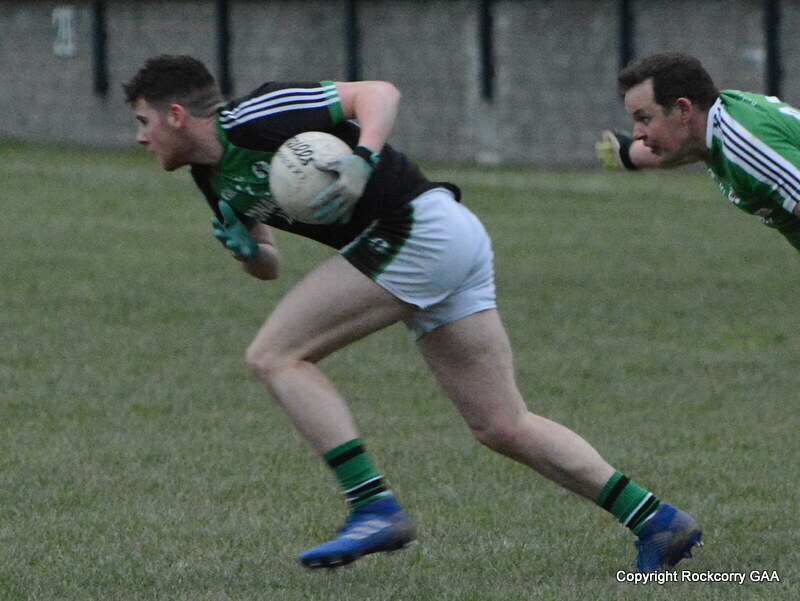 Cremartin responded immediately with a neat point from Johnny McGuigan and following good approach play from Noel Carroll and Lorcan Smyth who found Dwayne Rooney he teed up Colin Quinn who finished with a delightful point to leave the scoreboard showing Rockcorry 0-3 Cremartin 0-4. At this stage it appeared we had weathered the storm after a rocky opening period and there wasn’t any need for concern!!! 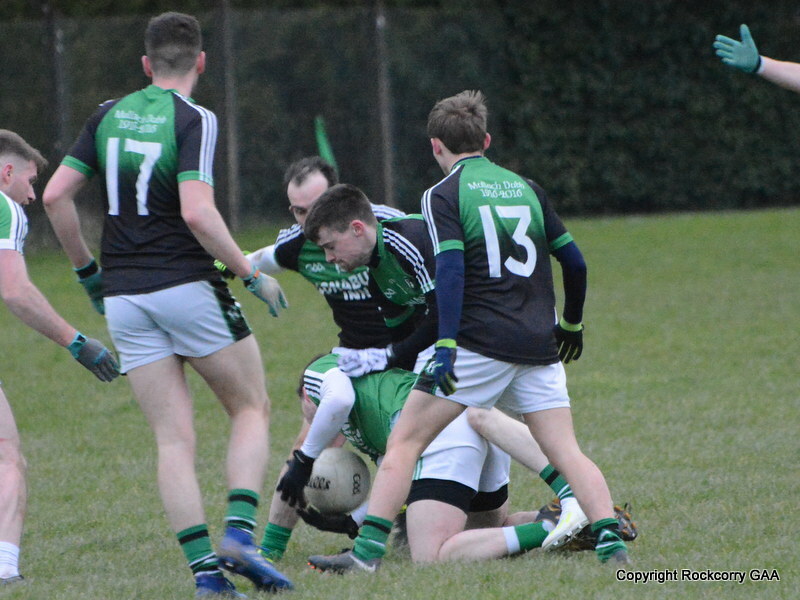 However, there was a bigger and more ferocious storm brewing as Cremartin regained the initiative and the remaining ten minutes of the first half were totally controlled by them and they rattled over four unanswered points, from Shane Burke and Paddy McNally, to open up a five point advantage to lead by 0-3 to 0-8 at the half time interval. Trailing by five points at the break we needed a big improvement if we were to salvage anything from the game. Thankfully, we made an extremely positive start to the second half with team captain Niall McKeown, who was carrying a niggling leg injury, doing his best to inspire his team mates, but his effort, after thirty seconds, drifted narrowly wide. 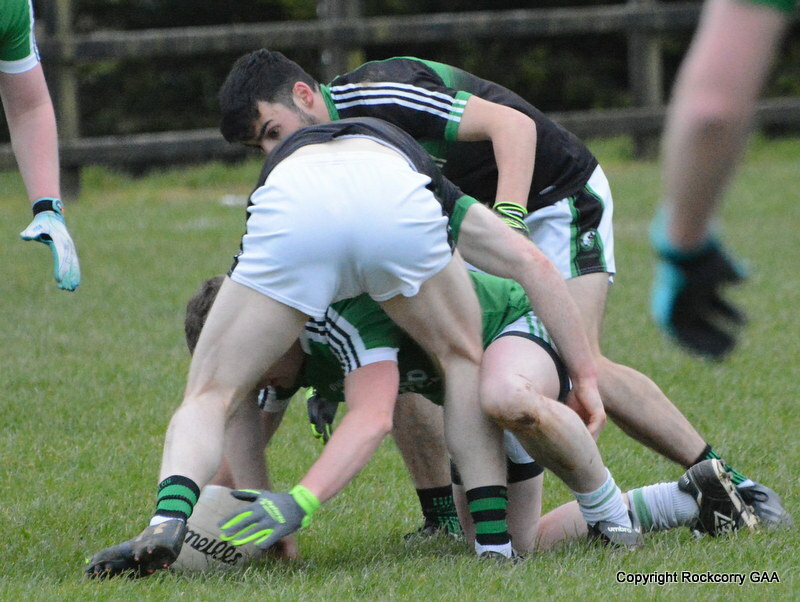 This seemed to ignite the lads and gave them a breathe of confidence (which lasted for six minutes) and a promising attack, two minutes later, ended with Lorcan Smyth being fouled and after he dusted himself down he dissected the posts spectacularly. Realising they were now in a game, Dwayne Rooney finished off a lovely move that involved Noel Carroll, Paul Mckeown and Mark Daly to reduce the gap to three points and when Garry Calvert was brought down on the 6th minute Mark Daly lobbed over the free-kick to leave the scoreboard showing Rockcorry 0-6 Cremartin 0-8. Unfortunately, that was as good as it got as, our mini comeback, our mini purple patch, was just that ‘mini’ because we would fail to register another score until the closing minutes. During the next twenty minutes or so it was virtually all one way traffic and we were mostly on the back foot as Cremartin took charge and proved more decisive up front and fired over some exhibition points (seven points without reply) courtesy of Kevin McVicar 0-3, Liam Atkinson 0-2, Kevin Atkinson 0-1 and Shane Burke 0-1, to open up a commanding 0-15 to 0-6 advantage. At this juncture, we were really finding it hard to create any clear scoring chances and when Lorcan Smyth was brought down on the 28th minute, and not for the first time this year, he stepped up and made no mistake to tap over the free-kick in fine fashion to raise a white flag, which sadly didn’t even raise a cheer from the home supporters. With the game effectively over and the outcome of the match unquestionably determined a dominant Cremartin side wrapped up the scoring on the 30th minute with literally the last kick of the game. A long high delivery into our danger area was bravely punched away by Jamie Smith only to the open and awaiting arms of Ryan Carragher, who I imagine said thank-you very much, and finished with a routine tap over to leave the final score Rockcorry 0-7 Cremartin 0-16. On reflection, it was a disappointing performance from the team and they looked a pale shadow of a side that we all know. When it came down to the real fight, Cremartin wanted it more. They were the better side on the night and showed a lot more hunger, they were faster, fitter and showed more desire for the win. I know we are in a difficult position at the moment and I know the past couple of weeks have been testing times for everybody involved with the club but if were not very careful we could find ourselves in a worst situation very, very quickly. It’s a true saying that “skill can only get you so far”, and the basic qualities of appetite, bottle and character are among other vital traits that a team requires and regrettably we only showed glimpses of them during the match. The bottom line now is that we need to pick ourselves up and get fitter and stronger for the next round of league matches because there is still plenty to play for. It’s going to take a lot of hard work, loads of commitment, plenty of sacrifices and will take leaders to lift the confidence levels within the camp. Remember lads, just because something isn’t happening for you right now doesn’t mean that it will never happen. Think positive, be positive and positive things will happen. Heads up, believe in yourself and your team mates and all I can say is keep on trying. 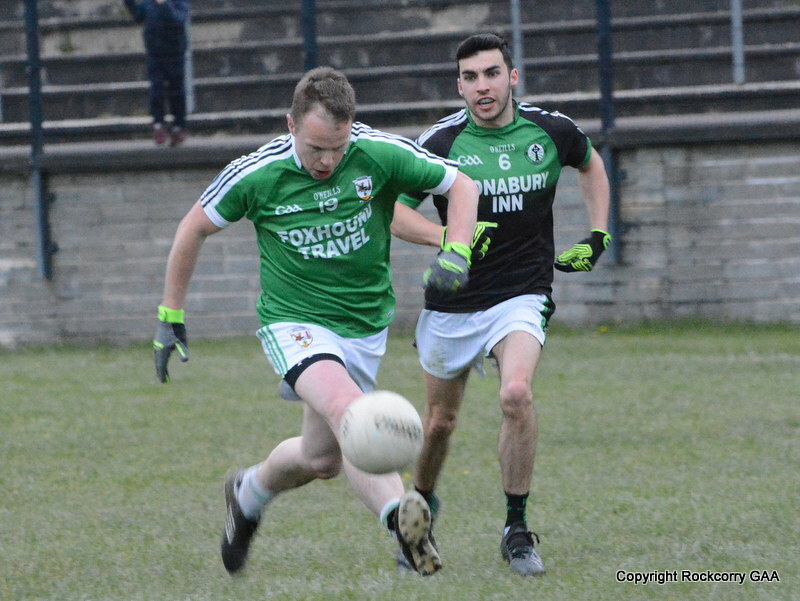 Team & Scorers: Jamie Smith, Cathal Sheridan, Keith Daly, Conor McGeough, Stephen McGuirk, Colin Quinn 0-1, Garry Calvert 0-1, Mark Daly 0-2f, Owen Fitzpatrick, Dwayne Rooney 0-1, Lorcan Smyth 0-2f, Noel Carroll, Niall McKeown, Paul McKeown and Anthony Tate. Subs: Christopher Greenan for Anthony Tate (injured). To view more action photographs from the match please click the link below to visit our Flickr page.